US Civil War Antique Maps. World & Hemisphere Antique Maps. 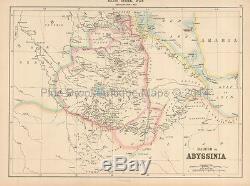 Ethiopia Antique Map Black 1867. This one of a kind original antique map of Ethiopia comes from Black's General Atlas of The World. Published by Adam and Charles Black in Edinburgh Scotland in 1867. Please check the legend for this maps condition. This authentic vintage map of Ethiopia was printed using steel plates with beautiful coloring on one side only with a blank verso or back side on sturdy paper. This old map of Ethiopia is truly a fine piece of Ethiopia history in the middle of the 19th century. This historical map of Ethiopia would make a fine addition to any collection or for beautiful display in home or office decoration. All maps come with a beautiful Certificate of Authenticity suitable for display with no pricing information (great for gifting). Also, when available, a copy of the title and contents page from the atlas the map came from. Our experience has shown that these large diameter tubes and loose rolling leave no paper memory. Pine Brook Antique Maps is committed to protecting your privacy. We will not sell or disclose any information that identifies you to a third party, Period! We may use the information we collect to periodically notify you about new services or special offers we think you'll find valuable. Pine Brook Maps does not sell, trade or rent your personal information to others. The item "Ethiopia Antique Map Black 1867 Original" is in sale since Tuesday, March 10, 2015. This item is in the category "Antiques\Maps, Atlases & Globes\Africa Maps". The seller is "hudsonbay" and is located in Newburgh, New York. This item can be shipped to United States, Canada, United Kingdom, Germany, France, Australia, Japan, South Korea, Indonesia, Taiwan, South africa, Hong Kong, Israel, Mexico, New Zealand, Philippines, Singapore, Saudi arabia, United arab emirates, Qatar, Kuwait, Bahrain, Malaysia, Brazil, Colombia, Costa rica, Dominican republic, Panama, Trinidad and tobago, Guatemala, El salvador, Honduras, Jamaica, Denmark, Romania, Slovakia, Bulgaria, Czech republic, Finland, Hungary, Latvia, Lithuania, Malta, Estonia, Greece, Portugal, Cyprus, Slovenia, Sweden, Belgium, Ireland, Netherlands, Poland, Spain, Italy, Austria, Switzerland, Norway, Ukraine, Croatia, China, Thailand, Antigua and barbuda, Aruba, Belize, Dominica, Grenada, Saint kitts and nevis, Saint lucia, Montserrat, Turks and caicos islands, Barbados, Bangladesh, Bermuda, Brunei darussalam, Bolivia, Ecuador, Egypt, French guiana, Guernsey, Gibraltar, Guadeloupe, Iceland, Jersey, Jordan, Cambodia, Cayman islands, Liechtenstein, Sri lanka, Luxembourg, Monaco, Macao, Martinique, Maldives, Nicaragua, Oman, Peru, Pakistan, Paraguay, Reunion.